This will be the final instalment of Mex-electrical posts, as I think I have covered most of the unique installations that you find in Mexico, and any 3rd world countries around the world. 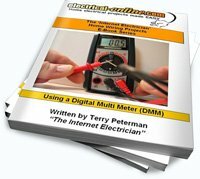 However, as I posted in a blog entry from January 2011, it’s not just the 3rd world countries that can fall short of acceptable standards for electrical work. In case you missed it, here is a lighted sign can fixture that I spotted while in Calgary Alberta Canada, a modern metropolitan center of over a million people. 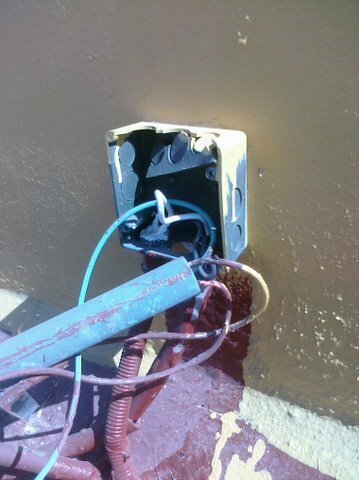 Hard to believe that something like this can happen in an area that adopts the Canadian Electrical Code (one of the most intensive set of rules in the world), and that this is on a commercial building where work is required to be done under an electrical permit, and by only a licensed electrical contractor. 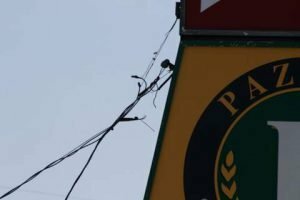 It’s likely an example of the business owner getting his brother-in-law to hook it up for him for the price of a free plate of chicken wings, and a couple of beers. Now back to Mexico. We’ll start with the ugly, and work our way back to the good. Here is our landscape lighting around the pool area in the courtyard of the condo complex that we stayed at this year in Bucerias. The power source feeding this arrangement comes up from the ground out of a sleeve of PVC pipe that is pointed straight up so as to collect the rain that falls in abundance during the rainy summer season. The power source is from standard 2-wire cable designed for light duty extension cords and is rotted away for the most part. 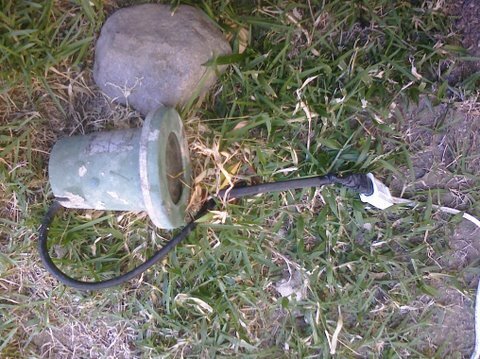 One cable is spliced without connectors or solder, and taped with regular electrical tape feeding a broken outdoor spotlight to highlight the shrubs. 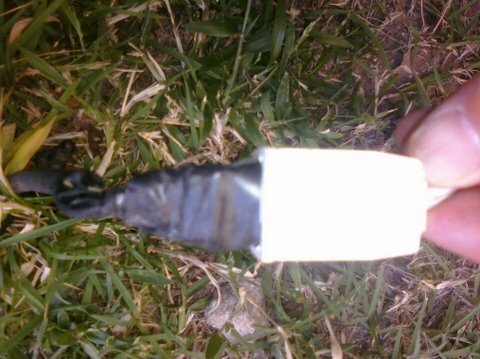 The other cable is stripped and twisted around the prongs of a male plug that feeds a 10ft. piece of LED rope light that is wrapped around a palm tree. To the credit of the craftsman the hooked this up, he did tape the prongs to limit the chance of accidental contact, and carefully laid the connection in the grass. This is about a full ½ stride off the pool deck so not much danger of stepping on this with wet feet! Here is the bad. 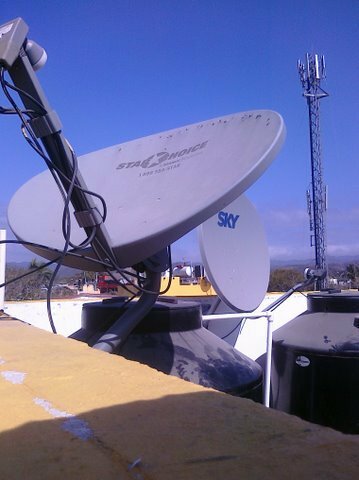 I had to climb up on the roof of the condo to switch my satellite feed from a SKY dish over to a Shaw Direct dish so I could have my regular TV programming via the receiver I packed with me for our month long stay. Up there we have the standard assortment of roof top A/C units, water pumps, and communications systems. 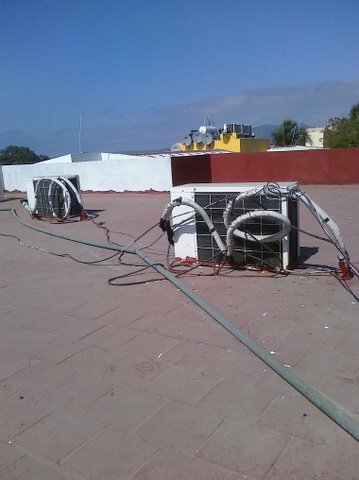 Here is a typical connection for a roof top unit. Notice that the cover plates are not installed so the rain can run on, into, and out of the box without collecting inside the box, thereby creating a dangerous situation (sarcasm)! Here is an overview of the network of conduits and wires necessary for the inter-connection of the equipment. Now let’s move on to what we call the good. I watched a building under construction across the street from us, and I notice some big improvements in modern electrical work (forgot to take a picture). They have all the proper tools, materials, and equipment readily available to them now, and many small electrical shops are located in the small towns surrounding Puerto Vallarta. In the city there is a modern Home Depot, and other large department stores where you can purchase the proper electrical supplies. One thing that I fail to understand is that they still treat the electrical work as an after-thought. They erect the structure (most commonly cinderblock and concrete), plaster on the final finish coat, and then they hammer drill in the pipes and wire for all the electrical outlets. They do a nice job of repairing the damage, but why not get those pipes incorporated inside the walls? Another project that was happening in the streets around us was a massive trenching project. I am assuming that is was for either fibre-optic cable, or new telephone cable as they were burying thin wall 4” PVC pipe along the main highway, and 2” PVC down the side streets. The back-hoe operator was extremely skilled, and dug a perfectly straight ditch to the proper depth. 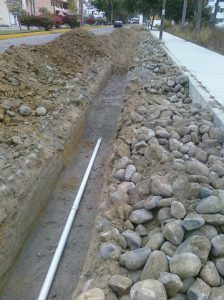 Then well screened bedding sand was laid down, the pipe on top of that, then more bedding material to surround the pipe. Then the native fill material was put back in and compacted diligently with gas powered packers. While the work being done was to top notch standards, combining the trenching, packing, and jack-hammering noise with the ever present sound of the traffic moving up and down the highway made for some peaceful lazy days lounging around the pool (more sarcasm). It’s good to see that the Mexicans are improving the standards for electrical installations, and contrary to the stereotypical image of a Mexican having a siesta under a palm tree, they work very hard, are eager to learn, and are generally a very happy bunch with a smile and a warm greeting for everyone they meet. What helps them enjoy life may have something to do with the fact that on February 28, 2011, the temperature in Bucerias was 85 F in the sunshine. My sister and brother-in-law flew home to Calgary with a bitterly cold temperature of -30 F with snow, ice, and a wind-chill of -40 F. That’s only a difference of about 125 F. Nice. For the time being, it’s Adios Mexico. I’ll be back! This entry was posted in Electrical Wiring, Outdoor Wiring and tagged conduit, electrical outlet, electrical wiring, landscape lighting, satellite dish, sign can, trenching, wires. Bookmark the permalink.